Dust storms and deflated fine-grained aeolian mineral particles (<62.5 μm) are subjects of growing interest due to their multiple influences on climatic and other environmental processes (Harrison, S.P. et al. 2001; Kohfeld, K.E. and Tegen, I. 2007; Maher, B.A. et al. 2010; Pósfai, M. and Buseck, P.R. 2010; Shao, Y. et al. 2011). Wind-blown dust absorbs, scatters and reflects both the incoming shortwave solar and the outgoing longwave radiation, so modifies the energy-balance of our planet. Mineral particles can change the albedo of surface (Arimoto, R. 2001), cloud-formation processes (Rosenfeld, D. et al. 2001; Sassen, K. et al. 2003), chemical properties of precipitation (Roda, F. et al. 1993; Rogora, M. et al. 2004) and also have an effect on biogeochemical cycles through Fe fertilization of iron-limited oceanic ecosystems (Ridgewell, A.J. 2002). The far-travelled dust material incorporates into the soil-system and increases its clay and fine-silt components even in distant areas. And at last but not least, the increased atmospheric concentration of PM10 and PM2.5 particles has major effects on human health. 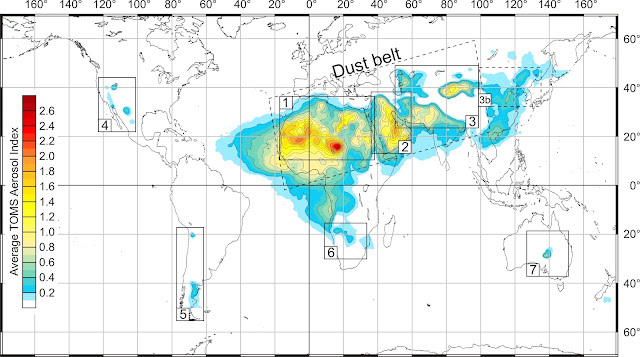 The global annual dust emission of mineral dust deflated from arid-semiarid areas is estimated between 1 and 3 billion of tonnes annually (Tegen, I. et al. 1996; Ginoux, P.M. et al. 2001; Zender, C.S. et al. 2003). Dust loadings of a given area have large annual and interannual variability controlled by several climatic and other environmental changes. The monitoring of dust storms and amount of emitted atmospheric dust can be indicative of these changes. In some periods of the Earth’s history, the intensity and frequency of dust storms could have increased by several orders of magnitude compared to the present situation (Mahowald, N. et al. 1999, 2006; Kohfeld and Harrison, S.P. 2001). Thus, dust records of accumulated aeolian dust deposits (red clay and loess deposits; dust samples of deep-sea sediments; terrestrial material in ice-cores) are of significant importance in reconstructing past climatic and environmental processes, circulation patterns, dust source areas and emissions (Pye, K. 1987, 1995; Pécsi, M. and Schweitzer, F. 1995; Kis, É. and Schweitzer, F. 2010; Kis, É. et al. 2011; Újvári, G. et al. 2012). The global mean map of the investigation period (1979–2011) shows the spatial distribution of the most important dust source areas. These are situated mainly in the desert, semi-desert regions, where dry, unconsolidated and unprotected fine-grained sediments can be easily lifted by the wind into the atmosphere. Albeit, the mechanisms responsible for silt production under warm-dry conditions have been a matter of scientific debate for many years, triggered by the absence of extent loess regions in the marginal zones of major deserts. However, recent observations have shown that aeolian and fluvial abrasion, salt and thermal fatigue weathering may also produce large quantity of silt-sized material. Various geomorphological environments (e.g. dry- and salt lakes, playas, wadis, ephemeral streams, alluvial fans) are also suitable for substantial dust generation (Assallay, A.M. et al. 1998; Wright, J.S. 2001; Smith, B.J. et al. 2002). It is important, that water (transportation by ephemeral streams or silt-storage in lacustrine environments) plays substantial role in formation of mineral dust particles, even in arid zones. Thus, the absence of extensive loess belt around hot desert regions cannot be explained by the insufficient amount of silt-sized material, it is much more likely that loess-formation was prohibited by lack of available vegetation traps for dust. However, long-range transport of small-dust particles (<20μm) with longer atmospheric residence time could have played some role in distant loess-formation processes; e.g. Saharan dust addition to Central and South European loess deposits (Cremaschi, M. 1990; Stuut, J-B. et al. 2009). As it is indicated by the thick loess blankets, during Pleistocene glacial periods the great ice caps produced huge amount of silty material formed by glacial grinding, but nowadays the low- and mid-latitude arid regions are regarded as the main dust source areas. Due to the spatial availability of the TOMS AI measurements (70°N–70°S), the artic regions with high aerosol emissions are not well represented at the mean maps. The high aerosol values in some equatorial regions and in East Asia are attributable to biomass burning and industrial pollution. It is clearly visible, that major sources are creating a more or less continuous region from the west coast of North Africa, through the Middle East into the direction of Central Asia. This is the so called “Global Dust Belt” (Prospero, J.M. et al. 2002). The average intensity of dust emission and annual frequency of dust storms outside the dust belt are relatively low, concentrated in small distinct areas. The dominance of the source areas located in the dust belt could be noticed much more on the mean TOMS AI distribution diagrams. 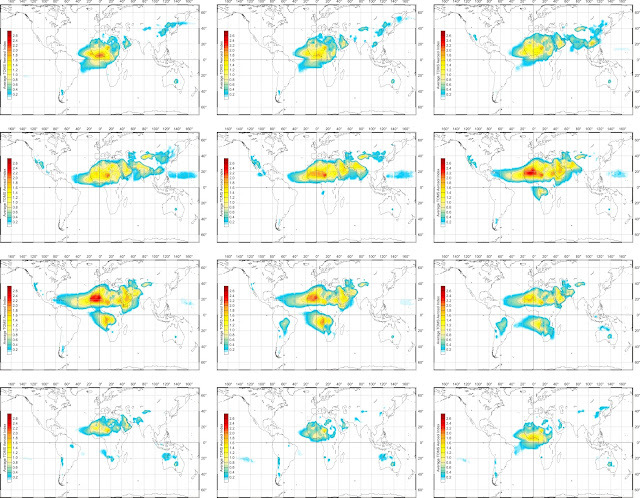 The global seasonal cycles of dust storms can be analysed by using the monthly mean aerosol maps. The source areas show large temporal variations in their dust emissions, related to various synoptic meteorological and local environmental factors (e.g. distribution of precipitation, thermal convectivity and wind patterns, seasonality of cyclogenesis and other synoptic patterns, vegetation periods etc.). In generally, it can be stated that in arid areas the seasonal maxima of dust entrainment occur typically during spring and summer, in the periods of highest wind-strengths and thermal convective activity. At some semi-arid and sub-humid, mid-latitude areas the peak of dust activity is at early spring (or late winter) before the vegetation-period, when fields are ploughed and the snow-cover has melted. The appropriate spatial resolution of the satellite measurements allow us to identify distinct source areas on regional scale within the above mentioned major dust source domains and to investigate their common geomorphological and sedimentary environment. The seasonality patterns of all sources were determined by the analysis of regional time-series data. The temporal characteristics of the regions make it possible to assess typical meteorological conditions favourable for dust emission. The most intensive and most important dust source areas are situated in the Sahara (and partly in the Sahelian region), responsible for 50–70% of the global mineral dust emission (Ginoux, P.M. et al. 2001; Miller, R.L. et al. 2004). Dust activity of North African sources shows large temporal variability. The second largest dust activity (after the Sahara) can be observed in the Arabian Domain, in the Middle East. Dust plumes cover large areas almost all year long at the Arabian Peninsula and at the Mesopotamian Plain. Arid-semiarid endorheic basins among high mountain belts, extensive flat terrains, deserts and hyper-continental climate provide suitable conditions for dust emission at several regions of the Asian Domain. Anthropogenic factors also play important role at some places, where the unreasonable constructions of irrigation channels and other agricultural activities have enhanced the dust activity by several orders of magnitude during recent decades. The most prominent dust sources of SW Asia are associated to shallow saline and dry lakes situated in closed basins, depressions between high mountainous belts and are fed by fine-grained material from these neighbouring elevated regions. Dust activity in the region is visible on TOMS aerosol maps from March to August in the SW part of the United States and in northern Mexico. Several isolated source regions are situated in the Great Basin bordered by high mountain ranges of Rocky Mountains, Sierra Nevada and Cascades running parallel to the Pacific coast of North America. The internal drainage system of the contiguous intermountain highland basins can be characterized by distinct salt flats, playas, shallow lakes and deep alluvial deposits of fans (Muhs, D.R. in press). Three different clusters of dust source areas can be identified by the TOMS AI maps in South America. Despite to the fact that, there is seasonally huge amount of aerosol particles in South African atmosphere, this is primary related to biomass burnings, and dust emission is restricted to two, relatively small but fairly effective source areas. Dust emission of Australia can be connected to one dominant and three weaker source areas. Alpert, P. and Ziv, B. 1989. The Sharav Cyclone: Observations and some theoretical considerations. Journal of Geophysical Research 94: 18495–18514. Amante, C. and Eakins, B.W. 2009. ETOPO1 1 Arc-Minute Global Relief Model: Procedures, Data Sources and Analysis. NOAA Technical Memorandum NESDIS NGDC 24: 19 p.
Arimoto, R. 2001. Eolian dust and climate: relationships to sources, tropospheric chemistry, transport and deposition. Earth-Science Reviews 54: 29–42. Assallay, A.M., Rogers, C.D.F., Smalley, I.J. and Jefferson, I.F. 1998. Silt: 2–62 µm, 9–4 Φ. Earth-Science Reviews 45. (1–2): 61–88. Babcock, E.A. 1974. Geology of the northeast margin of the Salton trough, Salton Sea, California. Geological Society of America Bulletin, 85: 321–322. Bagnold, R.A. 1941. The physics of blown sand and desert dunes. Methuen, London, 265 p.
Barkan, J., Alpert, P., Kutiel, H. and Kishcha, P. 2005. Synoptics of dust transportation days from Africa toward Italy and central Europe. Journal of Geophysical Research. Atmospheres 110, D07208. 14 p.
Bridges, E.M. 1990. World Geomorphology. Cambridge University Press, 272 p.
Cremaschi, M. 1990. The loess in northern and central Italy; a loess basin between the Alps and the Mediterranean regions. In: Cremaschi, M. (ed. ): The loess in northern and central Italy; a loess basin between the Alps and the Mediterranean region (guidebook to the excursion in northern and central Italy, September-October 1988). Pubblicazione, Dipartimento de Scienze della Terra dell'Universita degli Studi Milano. Sezione di Geologia e Paleontologia, Nuova Serie 602. pp. 15–19. Derbyshire, E., Meng, X. and Kemp, R.A. 1998. Provenance, transport, and characteristics of modern aeolian dust in western Gansu Province, China, and interpretation of the Quaternary loess record. Journal of Arid Environments 39. (3): 497–516. Duce, R.A., Unni, C.K., Ray, B.J., Prospero, J.M. and Merrill, J.T. 1980. Long-range atmospheric transport of soil dust from Asia to the tropical North Pacific: temporal variability. Science 209. (4464): 1522–1524. Engelstaedter, S., Tegen, I. and Washington, R. 2006. North African dust emissions and transport. Earth-Science Reviews 79. (1–2): 73–100. Fitzsimmons, K.E., Magee, J.W. and Amos, K.J. 2009. Characterisation of aeolian sediments from the Strzelecki and Tirari Deserts, Australia: Implications for reconstructing palaeoenvironmental conditions. Sedimentary Geology 218. (1-4): 61–73. Gill, T.E. 1996. Eolian sediments generated by anthropogenic disturbance of playas: human impacts on the geomorphic system and geomorphic impacts on the human system. Geomorphology 17. (1–3): 207–228. Ginoux, P.M., Chin, I., Tegen, I., Prospero, J., Holben, M., Dubovik, O. and Lin, S.J. 2001. 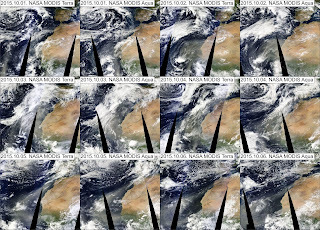 Global simulation of dust in the troposhere: model description and assessment. Journal of Geophysical Research 106: 20255−20273. Glaccum, R.A. and Prospero, J.M. 1980. Saharan aerosols over the tropical North Atlantic: mineralogy. Marine Geology 37: 295–321. Goudie, A.S. 1996. Climate, past and present. In: Adams, W.M., Goudie, A.S. and Orme, A.R. (eds.) The Physical Geography of Africa. Oxford University Press, New York, 452 p.
Goudie, A.S. and Wells, G.L. 1995. The nature, distribution and formation of pans in arid zones. Earth-Science Reviews 38. (1): 1–69. Goudie, A.S. and Middleton, N.J. 2006. Desert Dust in the Global System. Springer, 287 p.
Grousset, F.E., Ginoux, P., Bory, A. and Biscaye, P.E. 2003. Case study of a Chinese dust plume reaching the French Alps. Geophysical Research Letters 30. (6): 1277–1280. Hahnenberger, M. and Nicoll, K. 2012. Meteorological characteristics of dust storm events in the eastern Great Basin of Utah, U.S.A. Atmospheric Environment 60: 601–612. Harrison, S.P., Kohfeld, K.E., Roelandt, C. and Claquin, T. 2001. The role of dust in climate changes today, at the last glacial maximum and in the future. Earth-Science Reviews 54. (1–3): 43–80. Herman, J.R., Bhartia, P.K., Torres, O., Hsu, C., Seftor, C. and Celarier, E. 1997. Global distribution of UV-absorbing aerosols from Nimbus 7 TOMS data. Journal of Geophysical Research Atmospheres 102. (D14): 16911–16922. Hesse, P.P. and McTainsh, G.H. 2003. Australian dust deposits: modern processes and the Quaternary record. Quaternary Science Reviews 22. (18–19): 2007–2035. Jaffe, D.A., Anderson, T., Covert, D., Kotchenruther, R., Trost, B., Danielson, J., Simpson, W., Berntsen, T., Karlsdottir, S., Blake, D., Harris, J., Carmichael, G. and Itsushi, U. 1999. Transport of Asian air pollution to North America. Geophysical Research Letters 26. (6): 711–714. Kalderon-Asael, B., Erel, Y., Sandler, A. and Dayan, U. 2009. Mineralogical and chemical characterization of suspended atmospheric particles over the east Mediterranean based on synoptic-scale circulation patterns. Atmospheric Environment 43. (25): 3963–3970. Kis, É., Schweitzer, F., Futó, I., Vodila, G., Balogh, J. and Di Gléria, M. 2011. Special paleogeographic characteristics and changes in δ18O values in Upper Pleistocene deposits of the Moravian Plateau. Hungarian Geographical Bulletin 60. (3): 247–259. Kis, É. and Schweitzer, F. 2010. Dust accumulation and loess formation under the oceanic semiarid climate of Tenerife, Canary Islands. Hungarian Geographical Bulletin 59. (2): 207–230. Kiss, P., Jánosi, I. and Torres, O. 2007. Early calibration problems detected in TOMS Earth-Probe aerosol signal. Geophysical Research Letters 34. (7) L07803. 5 p.
Kohfeld, K.E. and Harrison, S.P. 2001. DIRTMAP: the geological record of dust. Earth-Science Reviews 54. (1–3): 81–114. Kohfeld, K.E. and Tegen, I. 2007. Record of Mineral Aerosols and Their Role in the Earth System. Treatise on Geochemistry 4. (13): 1–26. Liu, T.S. et al. 1985. Loess and the Environment. China Ocean Press, Beijing, 249 p.
Maher, B.A., Prospero, J.M., Mackie, D., Gaiero, D., Hesse, P.P. and Balkanski, Y. 2010. 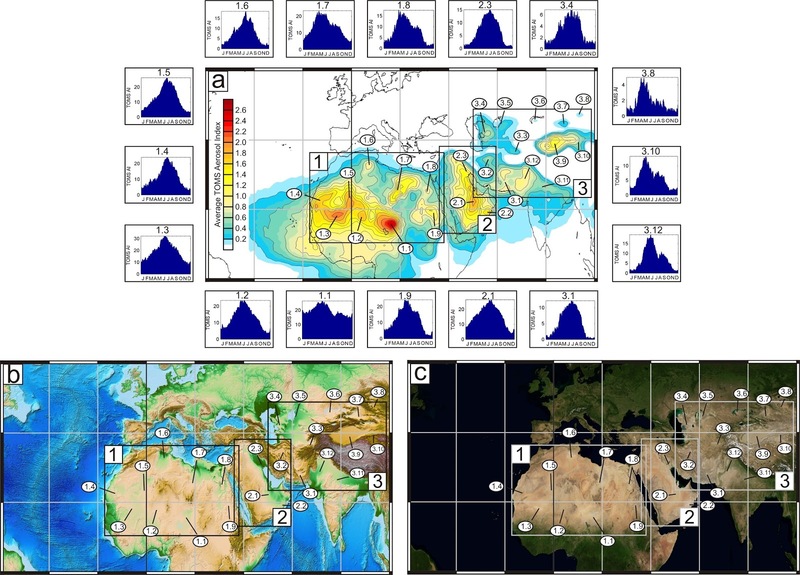 Global connenctions between aeolian dust, climate and ocean biogeochemistry at the present day and at the last glacial maximum. Earth-Science Reviews 99: 61–97. Mahowald, N., Kohfeld, K., Hansson, M., Balkanski, Y., Harrison, S.P., Prentice, I.C., Schulz, M. and Rodhe, H. 1999: Dust sources and deposition during the last glacial maximum and current climate: a comparison of model results with paleodata from ice cores and marine sediments. Journal of Geophysical Research 104: 15895−15916. Mahowald, N.M., Muhs, D.R., Levis, S., Rasch, P.J., Yoshioka, M., Zender, C.S. and Luo, C. 2006. Change in atmospheric mineral aerosols in response to climate: Last glacial period, preindustrial, modern, and doubled carbon dioxide climates. Journal of Geophysical Research 111. D10202. 22 p.
McTainsh, G.H. and Walker, P.H. 1982. Nature and distribution of Harmattan dust. Zeitschrift für Geomorphologie 26 (4): 417–435. Middleton, N.J. 1986. The geography of dust storms. Doctoral thesis, University of Oxford, 591 p.
Miller, R.L., Tegen I. and Perlwitz, J. 2004. Surface radiative forcing by soil dust aerosols and the hydrologic cycle. Journal of Geophysical Research. Atmospheres 109, D04203, 24 p.
Muhs, D.R. (in press) The geologic records of dust in the Quaternary. Aeolian Research. Paris, F. 1995. Le Bassin de l’Azawagh: pleuplements et civilisations, de néolithique á l’arrivée de l’islam. In: Marliac, A. (ed.) Milieux, sociétés et archéologues, Karthala, 227–260. Partow, H. (ed.) 2006. History of Environmental Change in the Sistan Basin – Based on Satellite Image Analysis: 1979–2005. UNEP Post-Conflict Branch, Geneva, 60 p.
Pearce, F. 2012. Inner Niger delta set to mimic the Aral Sea disaster. New Scientist 213 (2857): p. 9. Pécsi, M. and Schweitzer, F. 1995. The lithostratigraphical, chronostratigrphical sequence of Hungarian loess profiles and their geomorphological position. In: Pécsi, M. and Schweitzer, F. (eds. ), Loess InForm 3. Concept of loess, loess-paleosol stratigraphy. MTA FKI, Budapest, 31–61. Placzek, C.J., Quade, J. and Patchett, P.J. 2011. 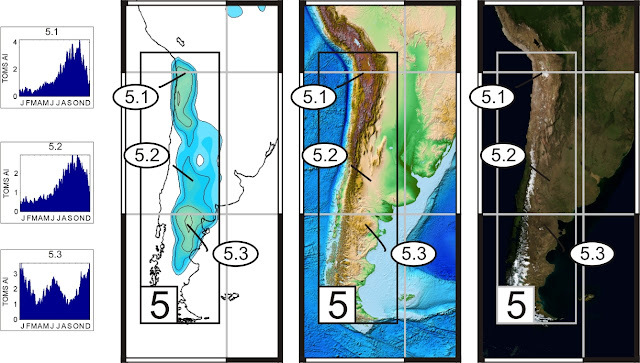 Isotopic tracers of paleohydrologic change in large lakes of the Bolivian Altiplano. Quaternary Research 75. (1): 231–244. Pósfai, M. and Buseck, P.R. 2010. Nature and climate effects of individual tropospheric aerosol particles. Annual Review of Earth and Planetary Sciences 38: 17–43. Prospero, J.M., Bonatti, E., Schubert, C. and Carlson, T.B. 1970. Dust in the Caribbean atmosphere traced to an African dust storm. Earth and Planetary Science Letters 9. (3): 287–293. Prospero, J.M., Ginoux, P.M., Torres, O., Nicholson, S.E. and Gill, T.E. 2002. Environmental characterization of global sources of atmospheric soil dust identified with the Nimbus-7 Total Ozone Mapping Spectrometer (TOMS) absorbing aerosol product. Reviews of Geophysics 40. 31 p.
Pye, K. 1987. Aeolian Dust and Dust Deposits. Academic Press, London, 334 p.
Pye, K. 1995. The nature, origin and accumulation of loess. Quaternary Science Reviews 14. (7–8): 653–667. Ridgwell, A.J. 2002: Dust in the Earth system: the biogeochemical linking of land, air and sea. Philosophical Transactions of the Royal Society A. 360: 2905–2924. Roda, F., Bellot, J., Avila, A., Escarre, A., Pinol, J. and Terradas, J. 1993. Saharan dust and the atmospheric inputs of elements and alkalinity to Mediterranean ecosystems. Water, Air, and Soil Pollution 66: 277–288. Rogora, M., Mosello, R. and Marchetto, A. 2004. Long-term trends in the chemistry of atmospheric deposition in northwestern Italy: the role of increasing Saharan dust deposition. Tellus B 56. (5): 426–434. Rosenfeld, D., Rudich, Y. and Lahav, R. 2001. Desert dust suppressing precipitation: a possible desertification feedback loop. Proceedings of the National Academy of Sciences USA 98: 5975–5980. Sassen, K., DeMott, P.J., Prospero, J.M. and Poellot, M.R. 2003. 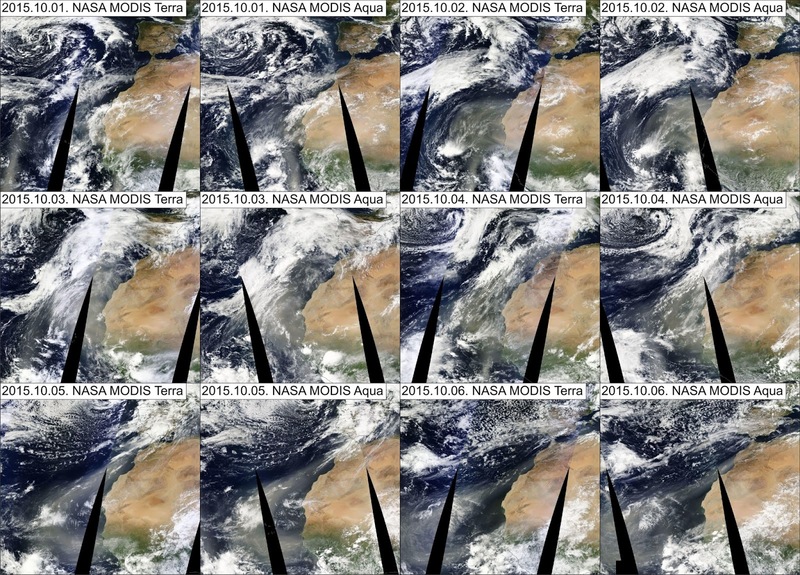 Saharan dust storms and indirect aerosol effects on clouds: CRYSTALFACE results. Geophysical Research Letters 30. (12), 1633, 4 p.
Shao, Y., Wyrwoll, K.H., Chappell, A., Huang, J., Lin, Z., McTainsh, G.H., Mikami, M.,Tanaka, T.Y., Wangh, X. and Yoon, S. 2011. Dust cycle: An emerging core theme in Earth system science. Aeolian Research 2: 181–204. Shao, Y. 2008. Physics and Modelling of Wind Erosion (2nd Revised and Expanded Edition). Springer, 452 p.
Smith, B.J., Wright, J.S. and Whalley, W.B. 2002. Sources of non-glacial, loess-size quartz silt and the origins of „desert loess”. Earth-Science Reviews 59. (1–4): 1–26. Strong, C.L., Parsons, K., McTainsh, G.H. and Sheehan, A. 2011. Dust transporting wind systems in the lower Lake Eyre Basin, Australia: A preliminary study. Aeolian Research 2. (4): 205–214. Stuut, J-B.W., Smalley, I. and O’Hara-Dhand, K. 2009. Aeolian dust in Europe: African sources and European deposits. Quaternary International 198. (1–2): 234–245. Sugden, D.E., McCulloch, R.D., Bory, A.J.M. and Hein, A.S. 2009. Inﬂuence of Pata-gonian glaciers on Antarctic dust deposition during the last glacial period. Nature Geoscience 2: 281–285. Swap, R., Garstang, M., Greco, S., Talbot, R. and Kallberg, P. 1992. Saharan dust in the Amazon basin. Tellus B 44. (2): 133–149. Tegen, I., Lacis, A.A. and Fung, I. 1996. The influence of mineral aerosols from disturbed soils on climate forcing. Nature 380: 419–422. Torres, O., Bhartia, P.K., Herman, J.R., Ahmad, Z. and Gleason, J. 1998. Derivation of aerosol properties from a satellite measurements of backscattered ultraviolet radiation: Theoretical basis. Journal of Geophysical Research Atmospheres 103. (D14): 17099–17110. 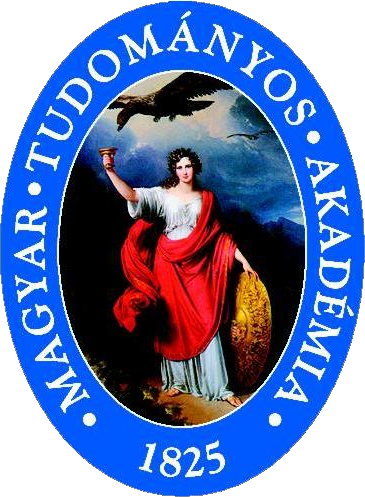 Újvári, G., Varga, A., Ramos, F.C., Kovács, J., Németh, T. and Stevens, T. 2012. Evaluating the use of clay mineralogy, Sr–Nd isotopes and zircon U–Pb ages in tracking dust provenance: An example from loess of the Carpathian Basin. Chemical Geology 304–305: 83–96. Varga, Gy. 2012. Szaharai eredetű por a Kárpát-medence légkörében. Földrajzi Közlemények 136. (2): 106–123. Washington, R.,Todd, M., Middleton, N.J. and Goudie, A.S. 2003. Dust-storm source areas determined by the Total Ozone Monitoring Spectrometer and surface observations. Annals of the Association of American Geographers 93. (2): 297–313. Wright, J. 2001. „Desert” loess versus „glacial” loess: quartz silt formation, source areas and sediment pathways in the formation of loess deposits. Geomorphology 36. (3–4): 231–256. Zender, C.S., Bian, H.S. and Newman, D. 2003. Mineral Dust Entrainment and Deposition (DEAD) model: Description and 1990s dust climatology. Journal of Geophysical Research Atmospheres 108. 4416. 19 p.
Zheng, H., Powell, C.McA., Butcher, K. and Cao, J. 2003. Late Neogene loess deposition in southern Tarim Basin: tectonic and palaeoenvironmental implications. Tectonophysics 375. (1–4): 49–59.